Step Into Magic Wonderland is a limited edition by Essence which invites us into magic wonderland with its light and pastel colors and lots of glitter. These are the types of products I imagine fairies would use. Let’s see if the fairies would be happy with the quality of the products. Eyeshadow palette consist of nine (mostly) cool toned shades. The variety of shades and finishes is nice. There’s four matte eyeshadows and five shimmers. The shimmers are not very shiny. They are not metallic, nor do they contain any glitter which is nice and surprising at the same time. The quality of the eyeshadows is what to be expected from a limited edition palette by Essence. Really no surprises there. It is not terrible, but not good either. It is OK, if you like those types of shades and if you like harder and not very pigmented shadows. 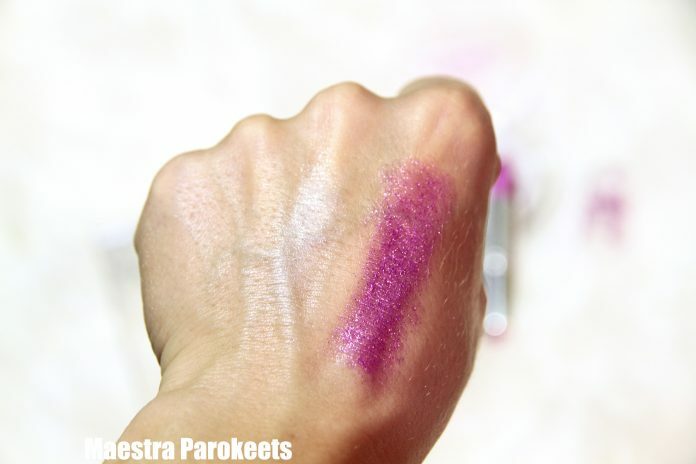 The darkest shades was the biggest disappointment, because it is just not pigmented at all. I had to rub hard to get any pigment at all. 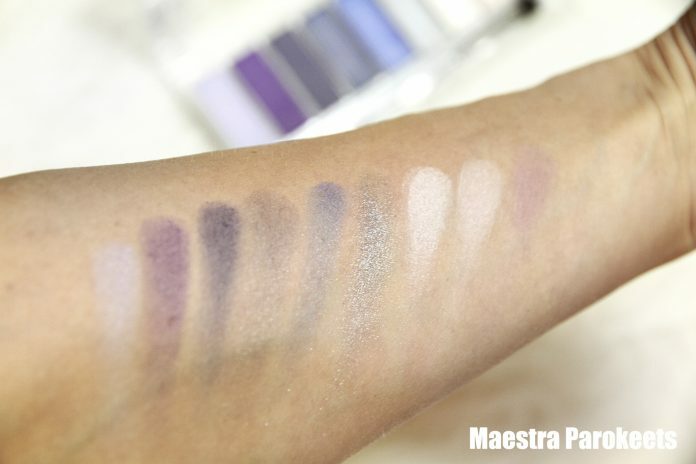 If you like Essence palettes and you like purple, grey and blue shades, than you will like this palette. 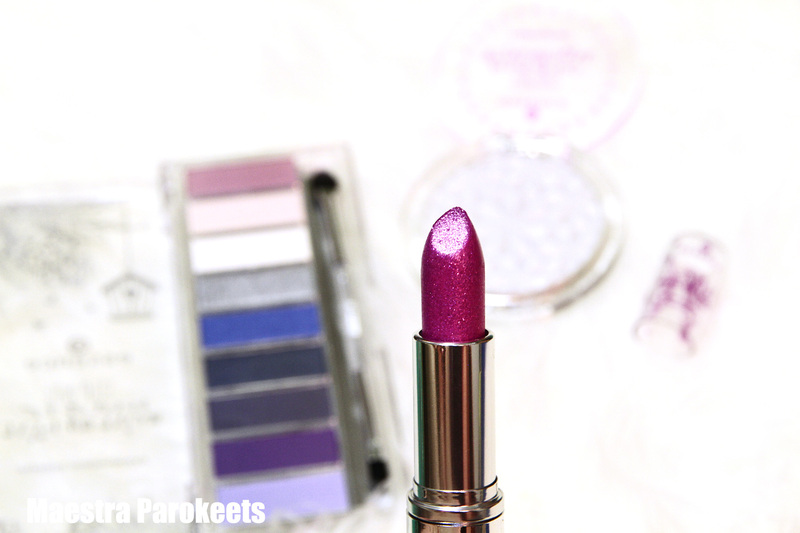 Glitter lipstick is a high shine lipstick with silver glitter. The pigmentation was surprisingly good and the application actually easy. The glitter is chunky and you can most definitely feel it when you rub your lips together. After a while I could also feel glitter in my mouth. Yes, I ate some of the glitter. And when the color of the lipstick fades, the glitter stays on the lips and you are left with tons of silver glitter on your bare lips. Not a pretty look of you ask me. This is just an OK lipstick with glitter and most definitely not a sophisticated lipstick with glitter. If you like these types of products and you don’t mind feeling the glitter on your lips or you need a fun glitter lipstick for a special occasion and you don’t want to spend a lot of money on it, than this is a good option for you. Grey Highlighter with silver particles. Highlighting and strobing is still HUGE! There is nothing wrong with that, but a grey highlighter with silver particles? Well, I just can’t imagine a single person that can pull this off on a regular day. Yes, I get it, that it can look fun for editorials or make up for special events. But this collection is targeted towards young women, girls even. That’s why I just feel I need to write a couple of words on that matter. This highlighter is just a fun product. If used very sparingly it looks OK, but than it is almost invisible, because the shine is just not there. I feel like this is just a grey colored setting powder with low shine and silver particles (glitter). I mean, this thing makes my skin matte and not shiny. And if I use more, than my skin looks matte and grey and not to mention silver sparkles. There is nothing magical about that. If only there would be awesome silver shine, maybe than this product would be great. Nope, not with this one. But that happens a lot with cheaper highlighters. The pigments that are used are just not as shiny as used in some expensive highlighters. Fact. There you have it. My thoughts on the Step Into Magic Wonderland collection. Please let me know in the comments if you bought anything and what you thought of it? Previous articleGOSH cosmetics once again available in Slovenia! Next articleSMASHBOX finally in Slovenia!